Monday, February 2, 2009 Posted by Stephanie H.
The Oil Rubbed Bronze Fire Bowl is one of the only fire pits on the market that is available in an oil rubbed finish. This trendy finish is quickly becoming popular as the preferred decorative home finish. It’s no surprise – with its rustic, antique look – this fire pit can easily transcend any backyard into a luxurious safe haven. The vintage appeal of this fire bowl cannot be held to any decorative limits in your backyard. Its beautiful finish can fit into any décor, and will easily make your backyard feel complete. This unique wood burning fire bowl is very easy to take care of – it should be cleaned regularly to ensure safer experiences and longer product life. Cleaning is simple – all you will need to do is wipe the exterior surfaces with a mild dishwashing detergent or baking soda. For tougher stains – a simple citrus based degreaser will easily do the trick! It’s also very easy to assemble. The first step that you will have to take is to attach the legs to the fire bowl with the supplied screws. Secondly, attach the base rings to the sides of the fire bowl. Next, you will need to attach the handle to the top of the spark guard. Lastly, you will have to set the wood grid on top of the base of the fire bowl, and place the dome-like spark guard on top. It’s that easy! 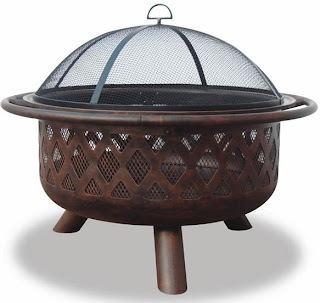 The cottage-feel crisscross pattern over the mesh in this deep fire bowl provides more heat and a larger view of the fire. The spark screen arrestor that is included will keep you safe while enjoying the warmth of your fire. The simple beauty and vintage style of the Oil Rubbed Bronze Fire Bowl will bring a look of modern elegance to your backyard. This fire bowl will certainly become the center of attention, and will make for many hours of fun, warmth, and memories on those cool evenings spent outside. How hard is it to dump the ashes? It is not hard to dump the ashes at all. Once the ashes have cooled, you can simply dump them out or use a fireplace ash vacuum to dispose of them quickly and easily! What is the recommended way to put out a fire in this model? With a fire pit like this - you don't need to put the fire out. It will burn out on its own.